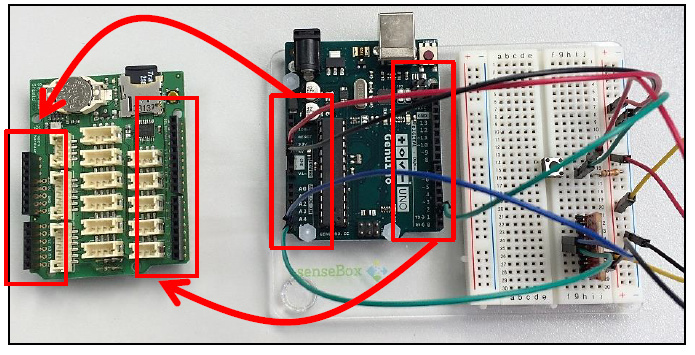 This tutorial is a step-by-step guide which will teach you how to build mobile sensor logging device using the senseBox Edu kit. 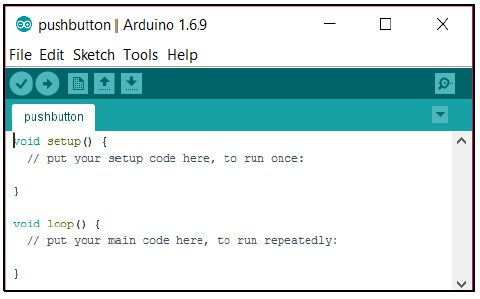 Extract the folder and copy the content to the libraries/ folder in Arduino’s installation files. Start with the basics… How to Push a button! Connect a red wire to the positive vertical row of the breadboard and to the 5 volt supply on the Genuino Board (A). 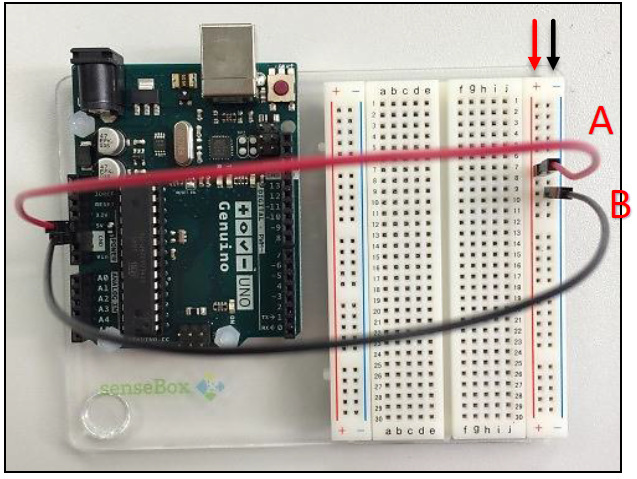 Connect a black wire to the negative vertical row of the breadboard and to the ground (GND) on the Genuino Board (B). Attach the pushbutton to the breadboard as presented below (A). Create a connection between one of the legs of the pushbutton and the ground with the 10K ohm resistor (B). 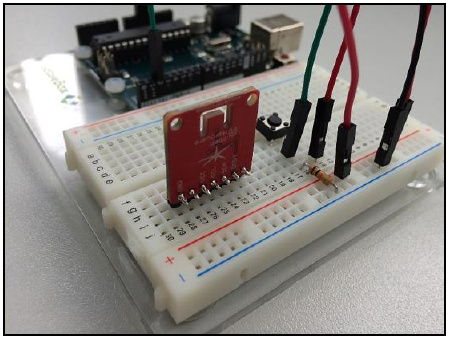 Connect a red wire to the positive vertical row of the breadboard (C). Provide with a green wire a connection between digital pin 2 on the Genuino Board and the leg of pushbutton connected to the ground. Programs written in the IDE are called sketches. Go to File New and name the file Pushbutton.ino or similar to create your first sketch. As a start you can may place the following code in your sketch. 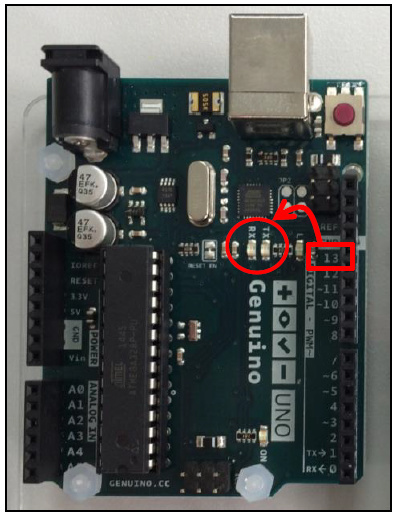 It initializes the which pins are connected to the LED light on the Genuino Board and the push button. Next, it provides the functionality to turn the LED light on when the button is pressed in. This LED is built-in in the Genuino board and driven by pin 13. 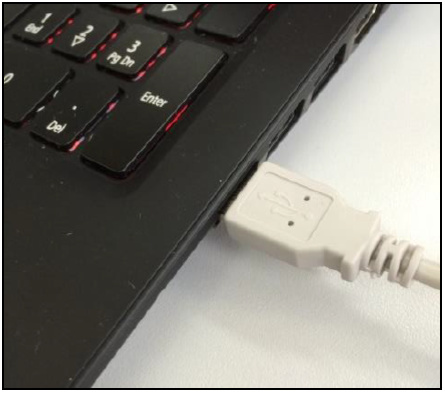 Connect the board to your computer with a USB cable. Compile the code by clicking on the Verify button (A). Click on the Upload button (B). Push the button on the board. A LED light on the Genuino Board should light up. 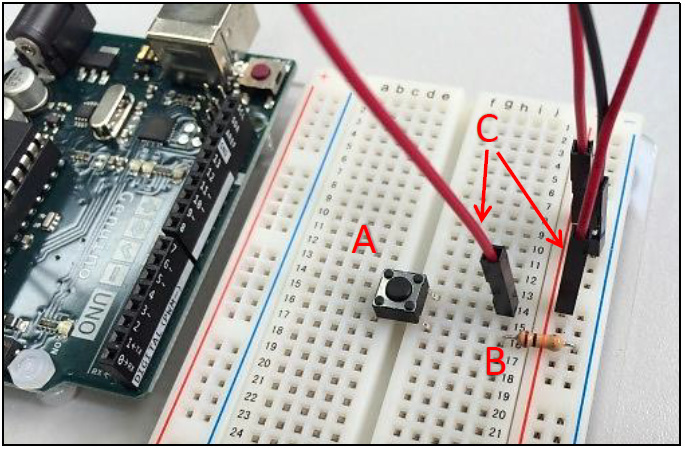 Connect the sensor to the breadboard. The labels on the sensor mark tell which pins need to be connected to the power and ground. If you are unsure, please consult the data sheet for your sensor. Connect a yellow wire to the positive vertical row and to the VCC pin of the sensor (A). 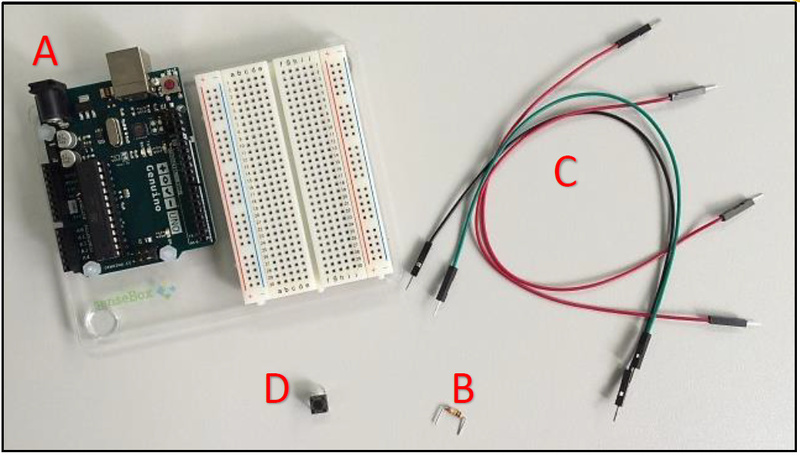 Connect a black wire to the negative vertical row and to the GND pin of the sensor (B). 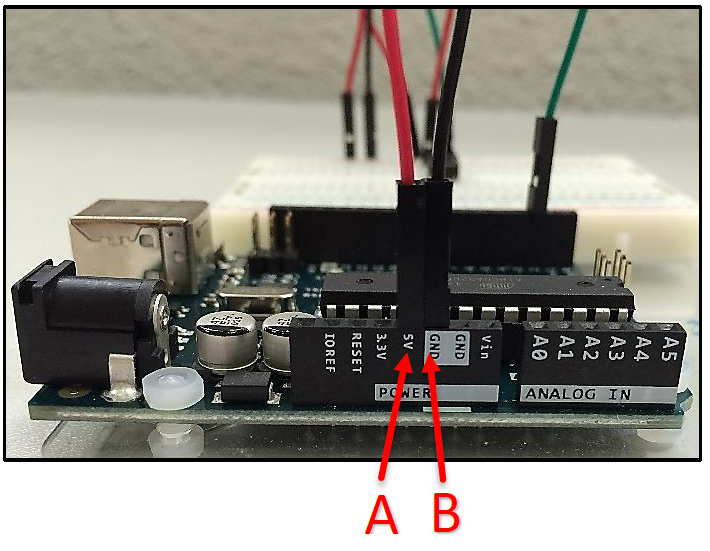 Provide with a blue wire a connection between the analog pin AV4 (you may also connect to another free analog pin; then check if you address the sensor in your code correctly) on the Genuino Board and the SDA pin of the sensor. 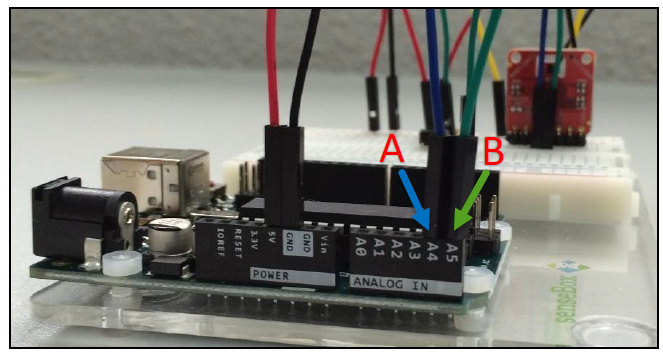 Provide with a green wire a connection between the analog pin AV5 (you may also connect to another free analog pin; then check if you address the sensor in your code correctly) on the Genuino Board and the SCL pin of the sensor. Go to File New and name the file PushbuttonTemperature.ino to create your own sketch. Wire.h provides functions to communicate with the data line (SDA) pin and clock line (SCL) pin. HDC100X.h makes communication and actions with the SD card possible. 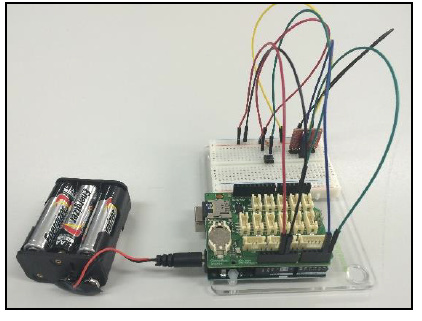 Create a connection with the sensor and pushbutton. Define variables for the button state and id. Initialize the pushbutton as an input. Read the value from the push button. If the button is pressed, measure the temperature and print it to the console. Compile your program and upload it to the board (A). Click on the Serial Monitor button. 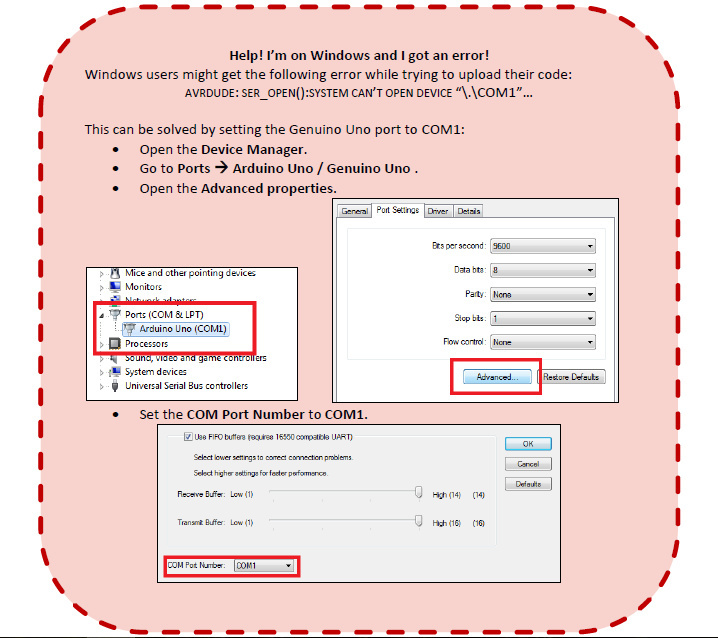 The COM1 dialog should pop up (B). Push the button on your board. A new result should appear on your screen (C). Your Arduino construction from the previous steps. A senseBox Shield with SD card slot. 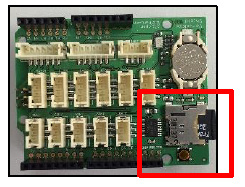 Since the senseBox Shield will be placed on top of the Genuino Board, the wires need to be connected to the senseBox Shield. Place the senseBox Shield on the Genuino Board. 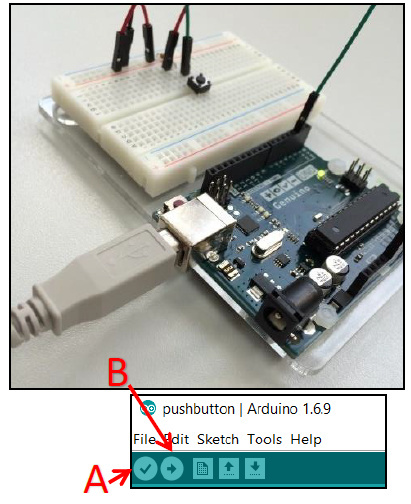 Open the file PushbuttonTemperature.ino in the Arduino IDE. Define a global variable which contains the identifier of the pin connected to the SD card. Initialize the SD card in the setup() function. SD.begin(chipPin); // initialize the SD card. 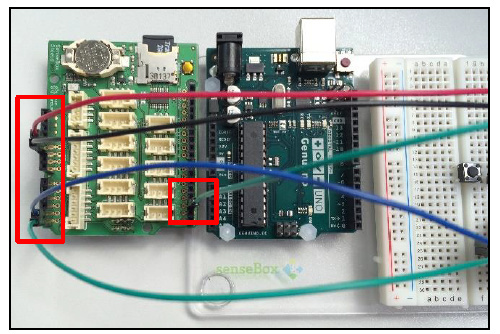 Place the SD card in the slot on the senseBox Board (A). Compile your program and upload it to the board (B). 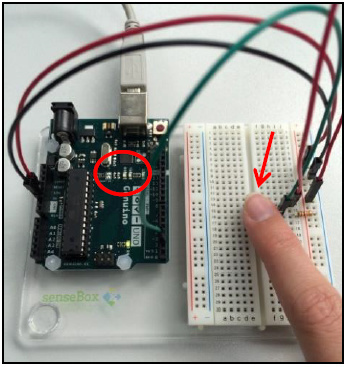 Push the button on the breadboard multiple times (C). Place the SD card in the card reader slot of your computer. You can now see the resulting temperature measurements. Time to go on a field study and measure the temperatures throughout the building and surroundings. 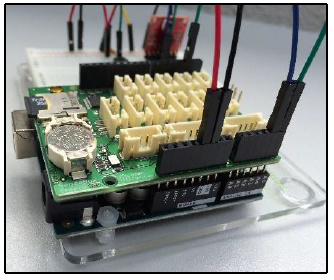 You can make your Arduino weather station more mobile by attaching a battery to the Genuino Board. Good luck during your expedition!